Really well written by a classic U2 fan. You appear to exhibit the 4 emotional states of change. Disbelief when discussing how Albums after their great ones did not meet the grade and did not meet the high standards of Achtung and Joshua Tree. Has come in that you accept that they will not make another great album in your estimation and should finish it. This is where I think you sit. BUT take heart in that commitment to live without U2 is around the corner. In asking them to put forward a last album you are calling them to account and then calling them home in a cry remoniscent of an old dog you have to put down and you are very sad, but its for its own good and you accept that it must end. 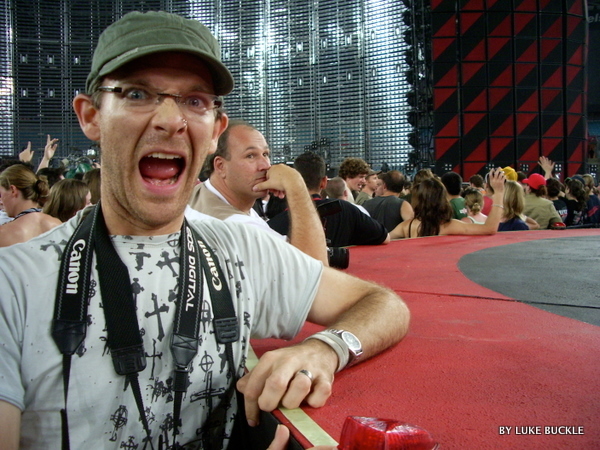 Luke, I hope this journey makes you stronger and appreciate you sharing your inmost U2 thoughts with us. That is hilarious. Even the bit about killing an old dog. Let’s call him, Bonzo. Well Luke, I disagree with almost everything you’ve said. I only became a “fan” of U2 at Achtung, and many fans from before that don’t like anything from that album onwards – that’s more about stylistic taste than poor songwriting or U2 being past their prime. But if you like the early sound I can understand you disliking the last three albums. I will agree that No Line was a dud. But it sounded to me like Bono just hadn’t put enough time into his lyrics – as a student of lyric writing myself, it just looked sloppy. I’m hoping for a better next album. However, your (and the critic you reference) denegration of the explosive chorus is crazy. It’s what U2 are known for, so why should they not write them? They sell well, stadiums can sing along with them and they make great rock anthems that push you out of your seat at concerts. I wish I could write such good choruses! I don’t think All That You Can’t was a shallow or cheap album. I think the ongoing spiritual journey of Bono/the band is really evident in that album. All the questioning and internal churning of the previous three albums had been let go, finally he/they had just decided to believe it because he/they wanted to – There were some black and whites after all, amongst all the grey!! “What you don’t have, you don’t need it now. What you don’t know, you can feel it, somehow”. I LOVED that album, and I connected with a lot of it, spiritually. Maybe you should take the lyrics of Elevation and question them as metaphors – what might he be talking about?? And Vertigo was similar – still showcasing Bono’s struggle between his belief in what’s right and his desire for doing wrong. So, maybe he has vocal issues, he does tend to scream and push his voice a lot. But that’s reason to get singing lessons, not quit singing. I’m sad you see so little in the last three albums. Maybe it’s a Gen X thing…he’s still telling our story….??? So we agree that based on Bono’s “Two crap albums and we’re out” rule, they are one away from splitting. I am saying that based on the last three, each lacking more magic than the last, their next album should be their last. Love your songwriter’s perspective. I didn’t realise ditching multiple songs was so commonplace. Bruce Springsteen has a tendency to cut really good songs if they don’t fit his album’s theme. However, he did end up releasing a huge box set of out takes called “Tracks”. I’m not sure if I agree with your two dud albums rules. I’d say that with artists that have released less material, they definitely should keep going. Your rule reminds me how much I wish Foo Fighters would retire. Their rut has gone on since 2002’s “One by One”, an album that has very few tracks played live and whose earlier produced results were discarded. On the other hand, Neil Young’s 80s period was poorly received by he successfully was back in good form by the end of the decade. This leads to Neil Young’s “Life” album. The title reflected how he felt trapped like a prisoner of David Geffen but also a lot of successful musicians do their job and passion like a life sentence. There’s just nothing else they could do for a profession and can’t leave. I don’t think the Rolling Stones, John Farnham, KISS or U2 can just quit this thing. However, as a friend pointed out to me, they could consider giving up recording and being full-time performers. I saw Belinda Carlisle a couple of years ago and she just played her greatest hits in a large RSL. It was a really entertaining show. I’d love just to see U2 perform their good material for 2 hours and not be subjected to the newer stuff. Oh, and to throw out a whole album’s worth of songs is pretty normal for good album makers. My album (and who did I have to impress – no one, really), took 50 odd songs to come down to 11 on the final product. Even big name artists who don’t write, but just select the best songs they can find from other writers, can reserve hundreds so that they can choose the very best possible. It’s based on the common 10% rule – only use your best 10%, the rest just isn’t your best. Luke, this is a cracker article, but I have to side with Naomi. Not because I’ve heard the last three U2 albums, the honest truth is I haven’t, but because your argument presupposes that Bono and his cohorts are incapable of producing the songs and/or sound you think is their benchmark. This I think, is an unfortunate presumption. Furthermore, in pursuit of a nostalgic desire to have what once was (desires founded on the esoteric memories of one) I feel you rob them of their right to artistic output for art’s sake. Should it always be for the fan? Or does a rock band that has succeeded at all levels have the right to do what simply pleases them? I like you, I am a collector of all things created by my all time favourite artist (in fact I’ve had to collect it all twice), but after 25 years I still enjoy the journey the artist chooses to allow me to experience. That journey may not be as good as their semenal years, nevertheless we are invited to join them. The critics say most of the last 10 years has been crap for my artist, but there is an enjoyable anticipation of the next big thing and I’m still enamoured enough with my favourite artist to believe that’s still possible. BTW I’ve always loved that picture of you beside the stage. Yo Lukas, I’m with you there. 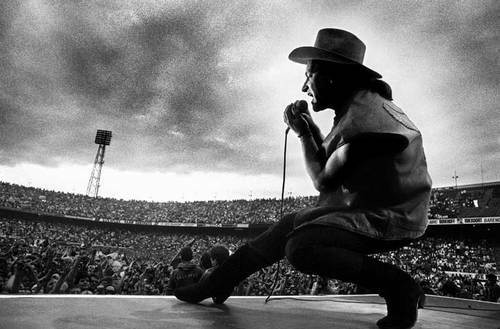 As you know, I was a massive U2 fan since the early 80’s and something happened when I bought No Line on the Horizon. I paid for, then listened to the album exactly once and then deleted it immediately. There was nothing interesting there, nothing that said give this a few listens and something great will emerge, just nothing – other than some pretty cringe-worthy lyrics and the smell of a complete mess of an album that still got released when it should have been killed. Since that day I stopped listening to U2 completely, other than hearing an occasional song on the radio, and that’s OK. They had some good 80s and 90s music and that’s that. I think music and all of us moved on and those guys just got stuck in a moment they can’t get out of… (see what I did there?!) Yawn. The music industry may well have been destroyed somewhere along that journey also, but I think it’s back now. Oh and I now have a pretty awesome back catalogue of U2 vinyl to sell one day (I hope).